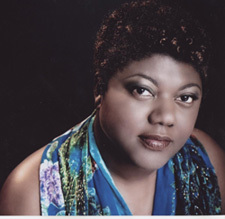 Michele Wood will give the Saturday, October 22, 2011 plenary session at the National Black Genealogy Summit. Her presentation is titled, "Not to Be Forgotten: One Artist's Journey of Going Back Home." Award-winning visual artist and illustrator Michele Wood will share her research and creative journey of the past 15 years. Ms. Wood's first Children's Book, Going Back Home: An Artist Returns to the South was inspired by her personal quest to the American South. "I felt that if I learned more about my heritage I might better understand who I am as an artist and an African American. My art is my way of looking back and documenting my history and creatively expressing who I am," Michele says. Today, Wood's latest genealogical research is developing into another project called Cut From the Same Cloth. An exhibition of her original artwork that also chronicles jazz and gospel history will be on view in the Jeffrey R. Krull Gallery of the Allen County Public Library's main branch throughout the entire conference. More about Michele and examples of her extraordinary work can be found at www.michelewood.com. A native of Indianapolis, Indiana, the amazing story of Michele’s rise as an artist began with her graduation in 1991 from the American Intercontinental University in Atlanta, Georgia. 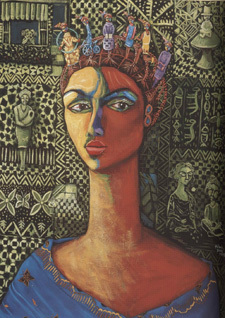 In 1994, the Apex Museum awarded the artist with a grant that allowed her to embark upon a pilgrimage to Yoruba Land in Africa. The experience gave her an opportunity to work with acclaimed Nigerian sculptor and educator Lamidy Olaude Fakeye. It made a lasting impact on Michele’s creative aesthetics and deepened her appreciation for empowering cultural and spiritual values and traditions. The public began to take increasing note of Michele’s evolving talent when, in 1993 and 1994, she produced the coveted Atlanta Jazz Series Poster. The posters instantly elevated her work to the status of highly-valued collectibles. 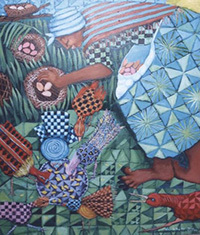 Since that time, this first hint at future achievements has been confirmed through the acquisition and commission of her work by such organizations as: the Toni Morrison Society, Black Entertainment Network, St. Jude Christian Church in Atlanta, the Didi Museum in Lagos, Nigeria, and Indiana State Museum. This session is sponsored by Friends of the Allen County Public Library.